We're getting Comcast in for our internet access at the office. Part of this process includes running the fiber into the building. To do so, Comcast has to run something in the range of a half-mile work of fiber from our office. 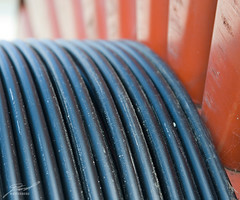 So this afternoon we have a big roll of cable parked out back. This certainly is not the largest roll of cable I've seen, but its the largest I've seen at the office.